WUOC 2014 was one of my main goals for this season and was a competition that I thought I would be able to perform well at. I was in good shape physically and my orienteering was not even comparable to my orienteering when I arrived in Europe over two months ago. 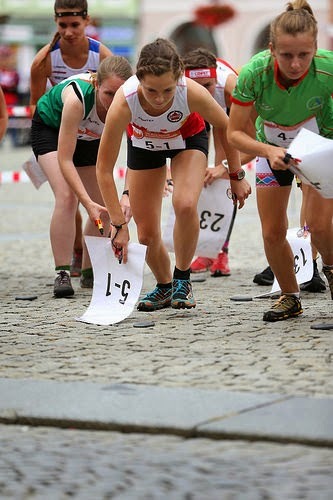 I was very well prepared for the races and new if I could orienteering at my own level and do my own race I would see some good results. The sprint started out very well for me as I was running fast but under control. Going to the 7th control I planned on going to the left as soon as I saw the leg but as I was running down the path the right option looked shorter so I changed my mind and went to the right. I did double check the map to see if I could get through and thought I could. It ended up that it was a trap. Looking at the map now I think I just saw the contour line under the black wall and the little tiny dot of white which made it look like I could get through when running at a high speed. That cost me way too much time and I was so rattled that I chose the worst route choice to the 8th control with 45m climb and didn't even see the other option. It wasn't my day and my result (44th) did not show what I was really capable of. I started out quite conservative in the middle running at around 70%, basically letting the orienteering dictate the speed and making sure I didn't lose time on the first few controls. I had a few smaller mistakes up until the 19th control where I lost control. As I left the 18th control I thought I was drifting off my compass going through the green and when I hit the trail I was confused and thought I could be at the trail junction to the NE. I continued to run down the trail until I was sure where I was and then attacked the control from there. I had another big miss at the 21st control after losing some confidence from the mistake at #19. I ended up with a result that I was happy with (53rd) but I know I have the potential to do much better that I did. My orienteering is slowly starting to become more equal with my running speed but I didn't feel like I pushed hard enough at any point during the race. The relay was really exiting and the most enjoyable race I have ever run. I had a really great race in general but again it could have been a whole lot better. It was pretty chaotic at the start of the mass start and I was happy that I was able to do my own race so that I went to all the right forkings and not just run like an idiot and follow whoever. I was running very well up until right before the spectator control where I got a bit ahead of myself in planning the final loop after the spectator control and skipped the 16th control. Something just didn't seem right as I was running to the spectator control and then I realized I had skipped #16 and had to start running back to it, most likely swearing the whole time as I crashed through the green as fast as I could. It is a terrible feeling running by so many teams that you were ahead of just because you unintentionally missed a control. I was running in 12th up until that point but dropped to 20th and maintained that position to the changeover and tagged off to Eric who was running second. Eric had a good run and tagged off to Graeme who also had a decent run. We ended up finishing in 18th which is the best result Canada has ever had if I am not wrong. 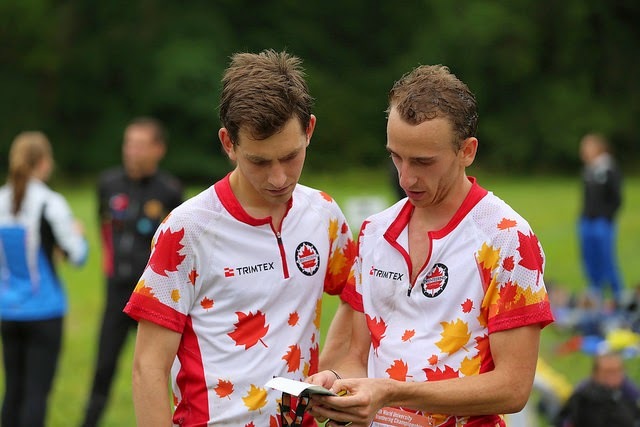 Thanks to coach Toni who gave us encouragement, advice and confidence when we needed it for each race and to team leader Jared who let us know everything that went on in the team leader meetings and who kept things organized. Also thanks to my teammates who made WUOC 2014 a memorable experience. 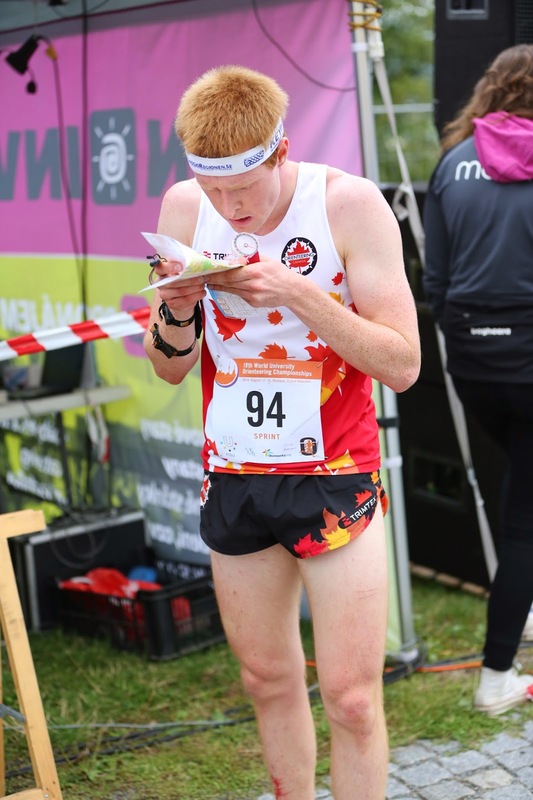 Next up is the US individual Championships in New York followed by the North American Orienteering Championships in Ontario in early October on back to back weekends. I will now take a bit of time off from orienteering and let the body and mind recover after a long two months of orienteering away from home. It will be nice to get back on a more consistent training plan after racing in Europe which requires a lot of resting to be added into the training plan before the major competitions. Click here for a high resolution map. The start triangle flag was about 10m from where we got our maps and the first legs were short, so you got thrown into fast decision making mode right off the bat. No room for errors! We then had a mixture of short and rout choice legs before a long leg in the middle that involved a right and left rout choice, but you had to make the decision before leaving the control. Because it was a long leg (even the winning man took 3.21 mins to complete), you really had to choose wisely or could loose quite a bit of time! I came to the decision control just after seeing Frederic Tranchand taking off,(a top French runner who ended up placing third) and it was reassuring to see him also come to a full stop when making the rout choice. (oh course at the time I didn't know he was looking at the same rout choice I was). 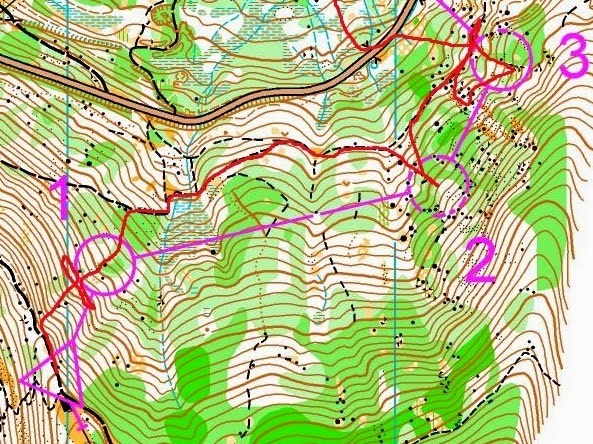 The end of the course was more basic with rout choices that were slightly less punishing BUT the elevation was enough! I kept having to tell myself “just keep running” on the uphill leg between 8, 9 and 10, telling myself that it was completely inexcusable to walk in a sprint. It was at this point my legs were really feeling running the long from the day before. I think I am going to blame my legs, which were requiring all the oxygen that I was breathing in, and therefore leaving none for my brain and resulting in me running right past my 11th control and a 45 second error right before the finish. Although I wished I was able to run faster, (and cleaner) everyone else was hurting too and it ended up being my top result in the week. Damian and Graeme also ran the sprint. Both the boys got caught by the fast paced short legs in the beginning and in the unforgiving time restraints of a sprint unfortunately that is all it takes to harm a sprint race. 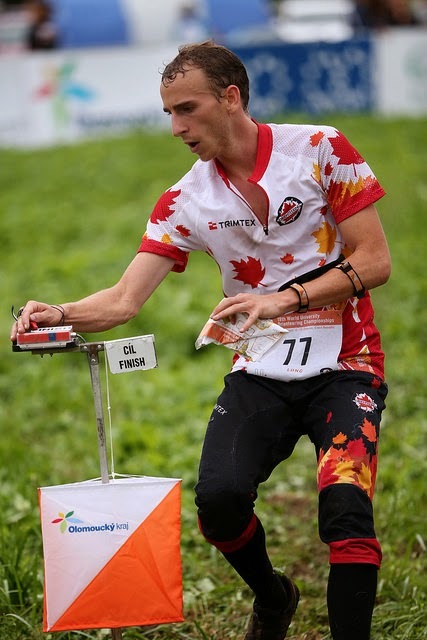 As the closing ceremonies happened yesterday we have now wrapped up an action packed week for the Canadian University Orienteering team. A big thank you to Toni, for his helpful coaching throughout the week, to Jared for his help as a team lead, Robert Svoboda for all the fantastic photos and to all the tireless volunteers and organizers who helped make WUOC 2014 such a success! 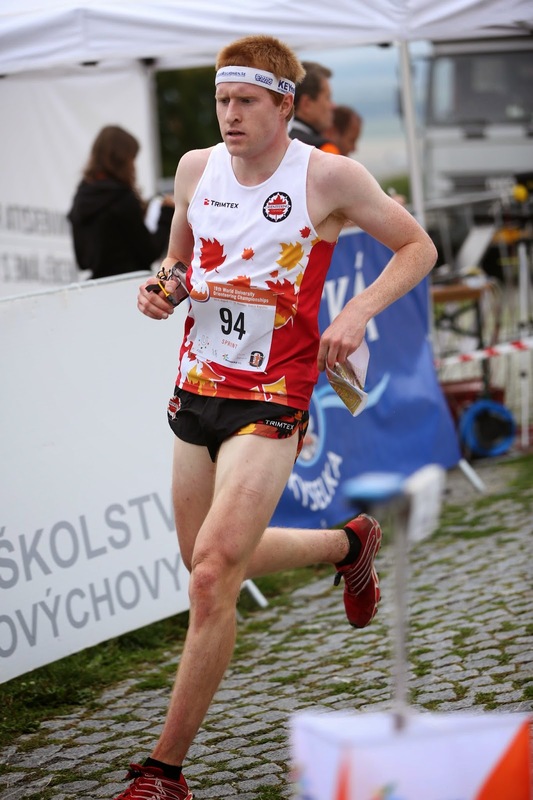 The first race of these World University Championships took place in the beautiful city of Kroměříž an hour’s drive from our home base in Olomouc. I haven't run very many Sprint Relays but I was super excited to be able to participate in this one and run the first leg to boot! Unfortunately the announcer counted down in Czech so I really had no idea when we were supposed to GO! Thankfully, in the list of countries Czech Republic is just after Canada so as soon as she took off I was close on her heels! Me, Emily Kemp, in the mass start. In the wise words of Coach Toni, I knew that I was there not for running, but for orienteering. This was key since from the map below you can see how much forking there was. And I can tell you that it was definitely best to keep one's nose glued to the map because there were people running EVERYWHERE!! The majority of the course being in the park meant that visibility was at 100% and sometimes I could see multiple controls at once! It was a fast paced race but I made sure to always make my own choices so it turned out that I was able to send Damian off in 5th just 40 sec off the leaders! Damian Konotopetz pushing the pace at the spectator control. Not only did he do his own race but he did a great race sticking with the countries he had gone out with and sending off Tori in 8th position. The last meter until Tori Owen passes off the relay to Graeme Rennie. The long leg in the park was tricky and the stinging nettle hidden in the grass was extra stingy but Tori did a superb job under the pressure of sprinting for your team! Graeme Rennie finishing off the relay with speed and style! Graeme was on last leg which is a tough job in the best of times but even more so when it was his first time running a Sprint Relay! He blasted through the course bringing us into a beautiful 17th position! Way to go Team Canada!!!! All photos are courtesy of the talented photographer Robert Svoboda. 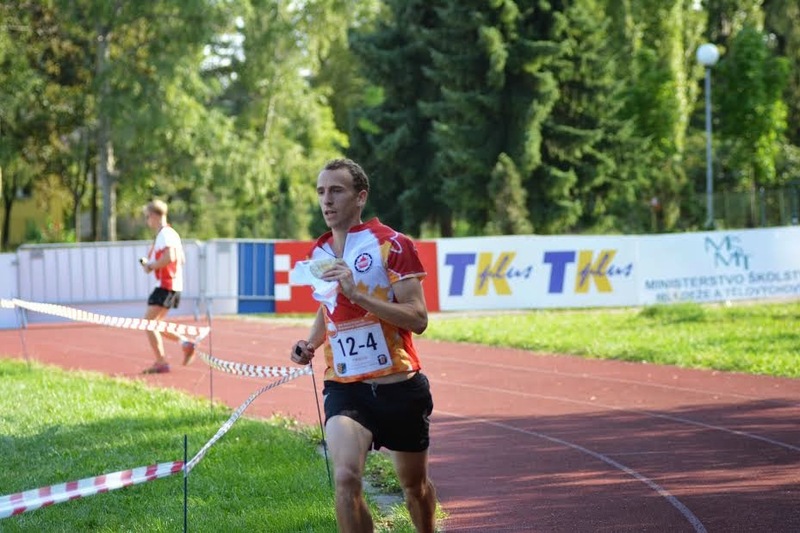 The first race at the World University Orienteering Championships (WUOC) this year was the sprint relay. This is a mixed-gender relay, with 2 men and 2 women. 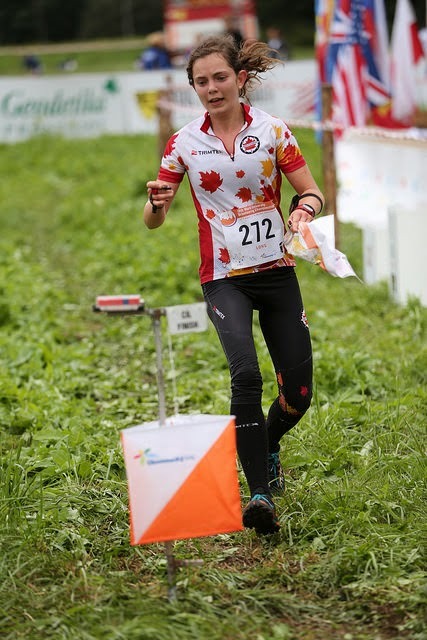 Emily Kemp started out for Canada, handing over in 5th to Damian Konotopetz. Damian had a great run to bring the team to the next changeover in 8th place. Tori Owen handed over to Graeme Rennie in 15th place, and Graeme brought the team home in 17th! Not a bad result for our athletes. Stay tuned to the blog for updates from the athlete's on their race! Today was the long distance. 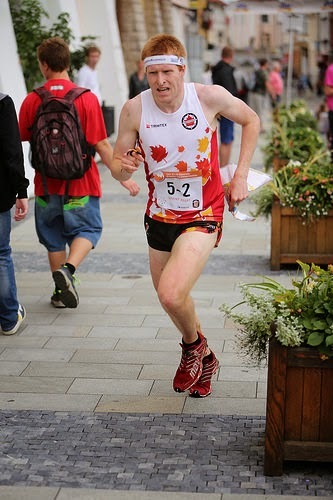 On the men's side, Eric Kemp and Graeme Rennie raced for Canada, coming in 70th and 73rd respectively. On the women's side, Emily Kemp came in 18th, and Tori came in 76th. Nice work guys! There's no TV coverage like with WOC, but you can view live results, maps, and split times on the WUOC website. Tomorrow (Thursday) is the sprint race. Friday is the middle distance, and Saturday is the relay... pretty packed schedule, but our awesome athletes can handle it! Leave your messages of support for our athletes in the comments! GO CANADA GO! 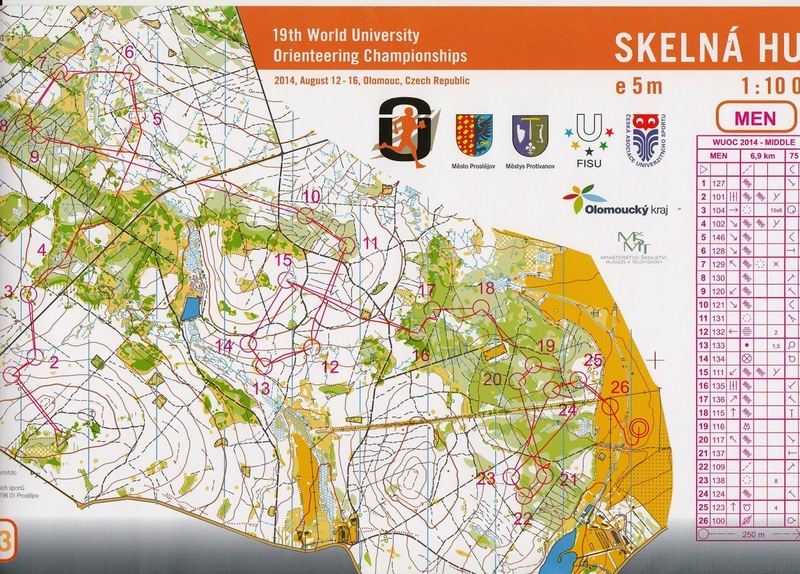 The 19th World University Orienteering Championships are officially open! This past weekend was the official training weekend and most of our athletes were able to make it onto all of their model maps. 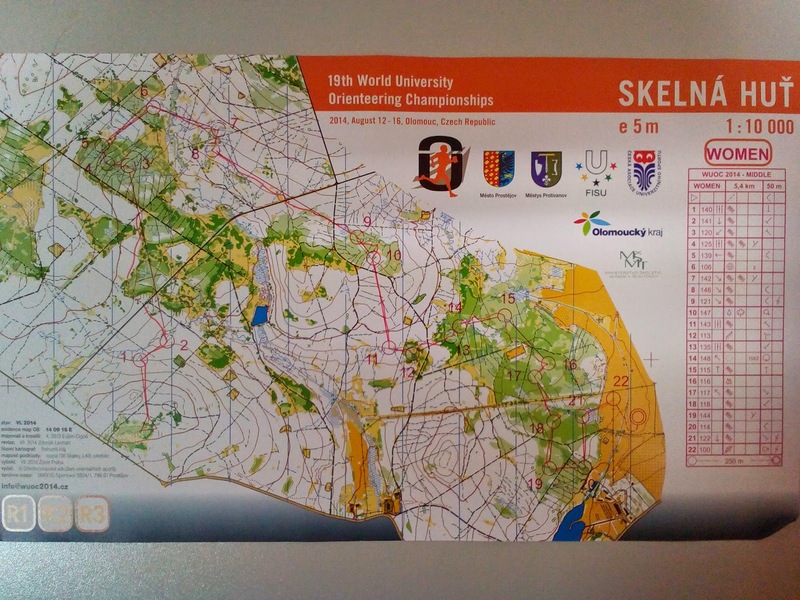 Last night was the opening ceremonies – The 19th World University Orienteering Championships are officially open! The first event, the mixed sprint relay, is happening this afternoon. 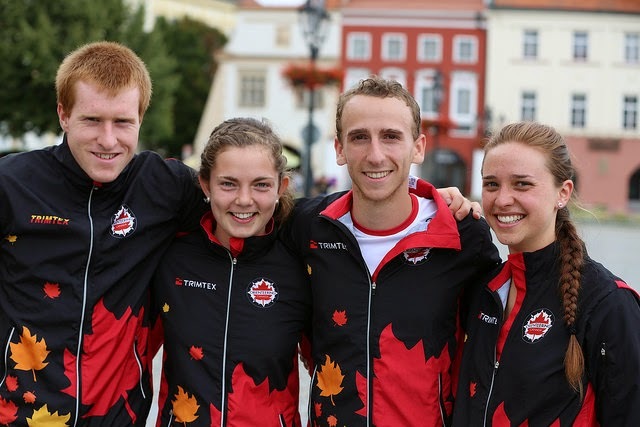 On the Canadian team we have Emily Kemp, Damian Konotopetz, Tori Owen, and Graeme Rennie. 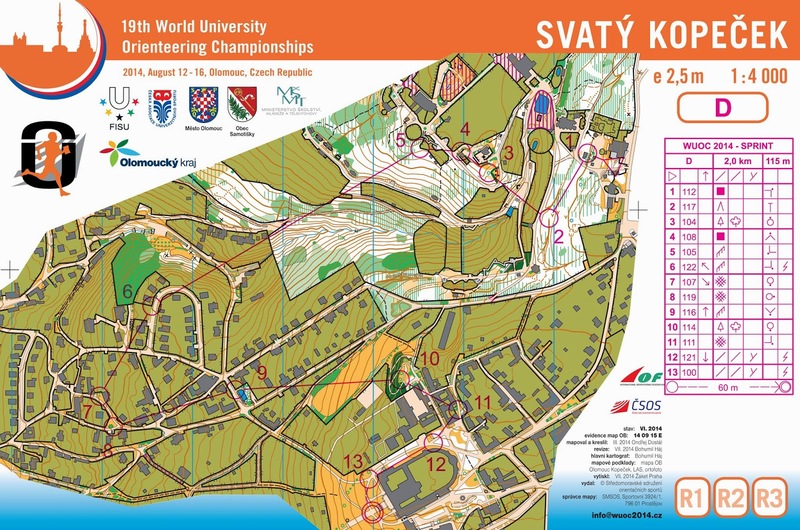 World University Championships (WUOC) ~ Coming soon! 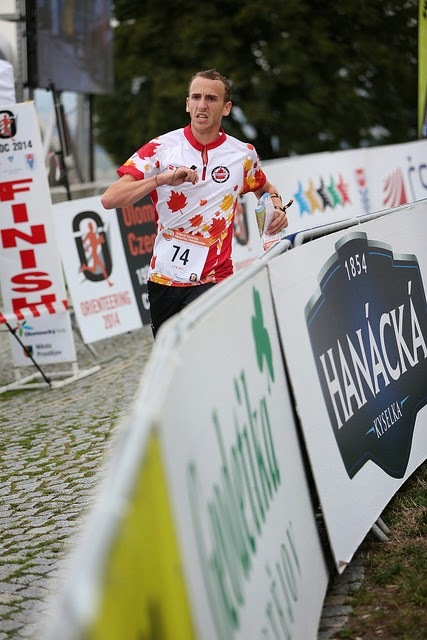 The Canadian Team has arrived in Olomouc, Czech Republic for the World University Orienteering Championships (WUOC)! The four day WUOC training camp has just come to a close, and the official model events begin today and continue over the weekend. The official races will run next week from Tuesday, August 12 to Saturday, August 16. 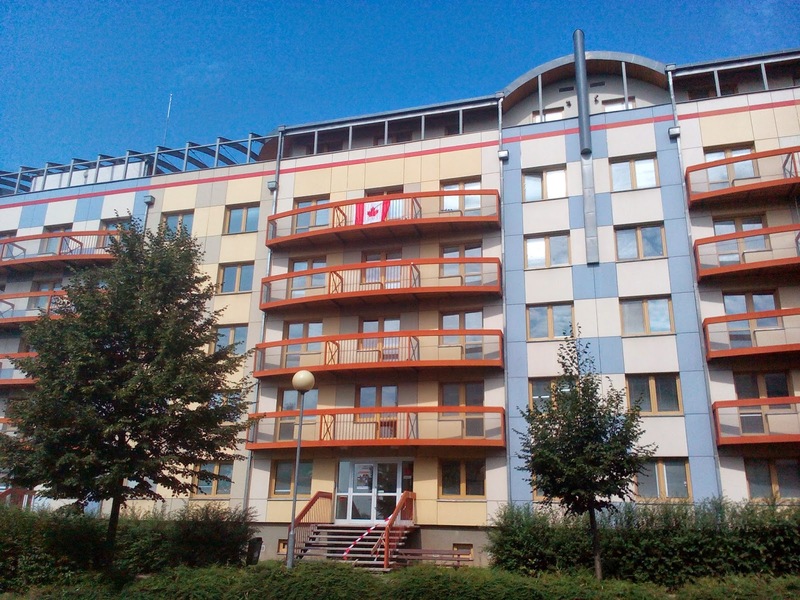 The 2014 Canadian WUOC Team consists of five athletes. The womens team consists of Emily Kemp and Tori Owen and the mens team includes Eric Kemp, Damian Konotopetz, and Graeme Rennie. Toni Louhisola the Senior Athlete Coach will be coaching Team Canada throughout the duration of the competition. The schedule for the week and which athletes will compete in each of the five WUOC races is shown below. We will be posting updates to the blog during the preliminary events and especially during the races next week, so stay tuned! 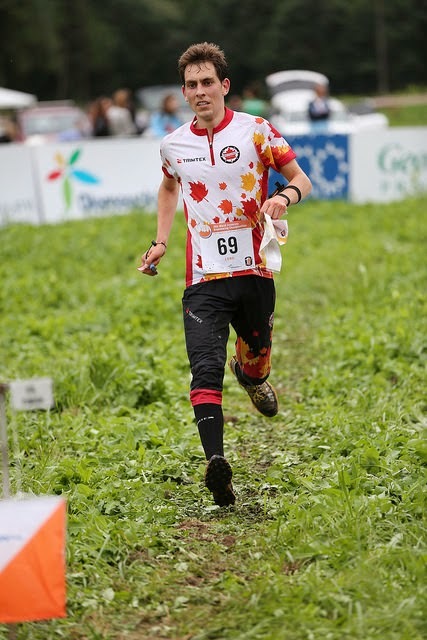 Since arriving back in Canada, I have had some time to dwell over my JWOC races and pin-point what went well and what needed improvement in each of my races. I am specifically going to focus on the long because it was a very unique long in certain ways and a race that helped re-build my confidence. One thing that struck me as slightly odd about this race was how much downhill running we had (usually its the other way around). 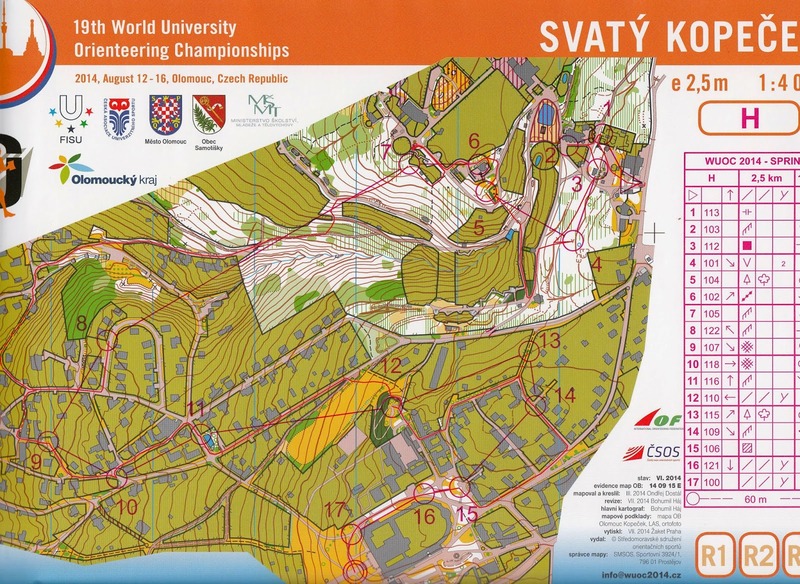 The race was held near a ski resort which seems to be a re-occurring theme at JWOC. We started at the top of the mountain and ran all the way down but not without what felt like an absurd amount of uphill (turned out to be only 270m). 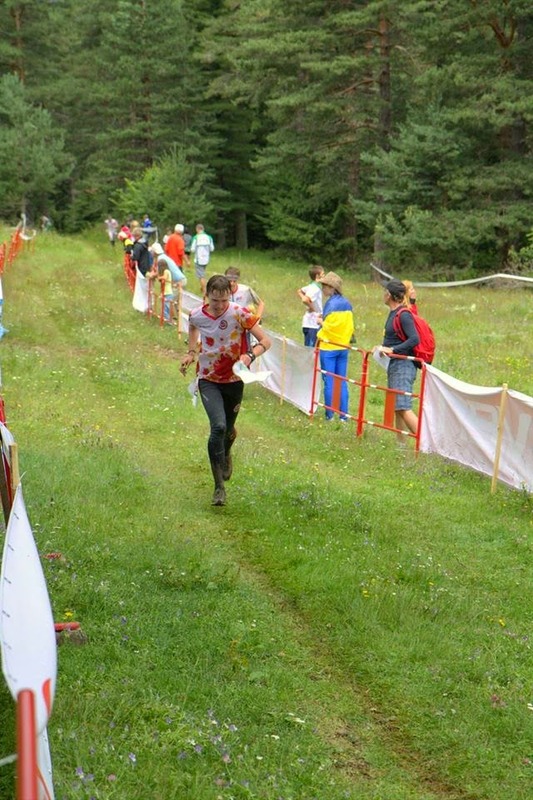 This is not how you want to start a JWOC race. It all started from some nerves at the start line which eventually lead to complete panic. Needless to say, I was a little shaken by the time I had found control 3 having already lost at least 10 minutes. It was a wake-up call, reminding myself that this race was going to be just as technically challenging as it was physically. The next few legs went surprisingly well, as I found them without a hitch before hitting the butterfly loop. It was like deja-vu from the first three controls. Not only did I have have trouble with these controls but it was the beginning of 125m climb through the spectator control (why they do this, I have no idea. Everyone is so exhausted and in a lot of pain resulting in very awkward photos). I should also note that the men had a map exchange going through the spectator control so we had no idea what was coming next. Now you are probably wondering why I wrote about this race seeing as how many things went wrong. 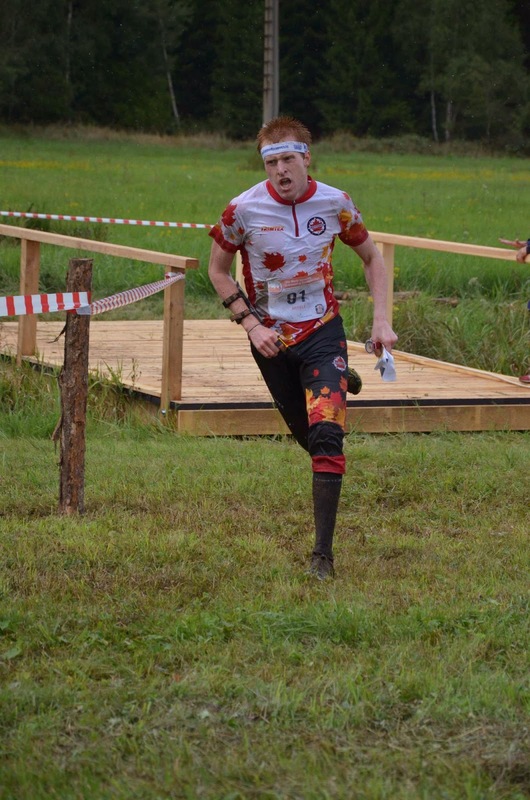 The best part of this race wasn't the unique terrain, results or the orienteering but rather how much fun I had out there. I have never been so wet, so exhausted and had so much fun. This was the first WOC that I attended and was exciting and overwhelming all at once. It is pretty neat and motivating to be able to compete against such strong competition. Me competing this year was part of a much longer term goal and therefore was a way to get some great racing experience. I knew I was nowhere near the speed of most of the runners there and so just wanted to be able to run some races I would consider good for my self. Which is easier to say when you are booking your trip 6 months in advance then when you are in the WOC arena! I was pretty nervous before this race, it was the first one of the week and my first one ever…Thankfully the qualifiers were in the morning and so we didn’t have to wait around all day. After breakfast we drove to our ‘quarantine boat’ which drove us to Burrano Island where the qualifier took place. It was pretty crazy being in the gym waiting for your start and because there were heats you started at the same time as two other people! For me, my goals were to try and run as clean as possible without miss punching or going to the controls in the wrong order (which sounds like a pretty dumb goal except when you see some sprint maps with lines going everywhere- it can get confusing when you are sprinting and your brain is low on oxygen!) and then of course run as fast as I can and have fun! During the race I made a couple mistakes, missed a turnoff and run down an alley to far and also almost started running down the wrong side of a canal before I caught myself BUT overall I was happy with my run. 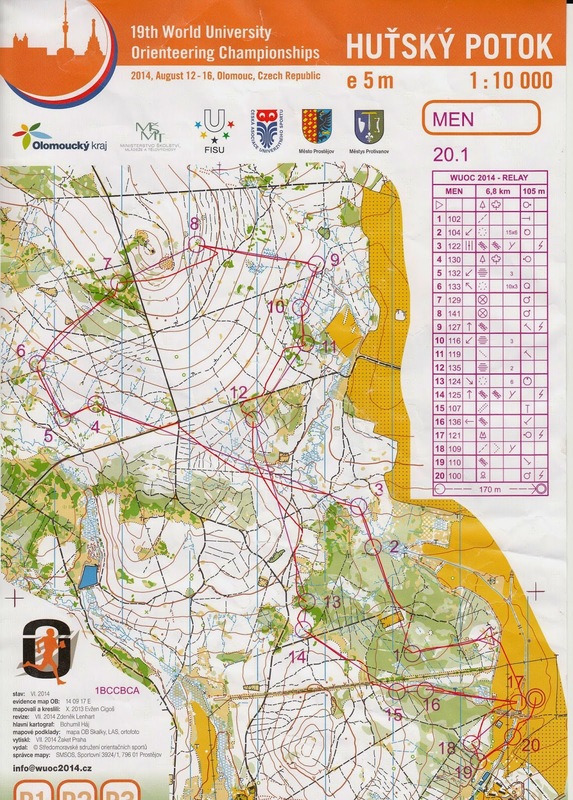 I was able to realize my mistakes when I was doing them and correct without losing huge amounts of time (I was a bit late on the alley one but… such is orienteering) So when I finished having run as hard as I could and saw my printout had no miss punches on it I was almost giddy with relieve! I had finished my first WOC race and no blow ups! Then I got to enjoy the rest of the day in Venice watching the final. 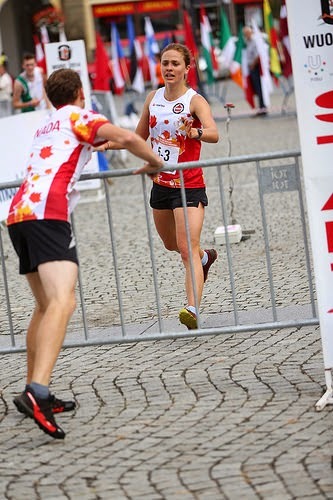 This year’s WOC sprint relay was the first sprint relay that team Canada had participated in and I though it merited a quick word! 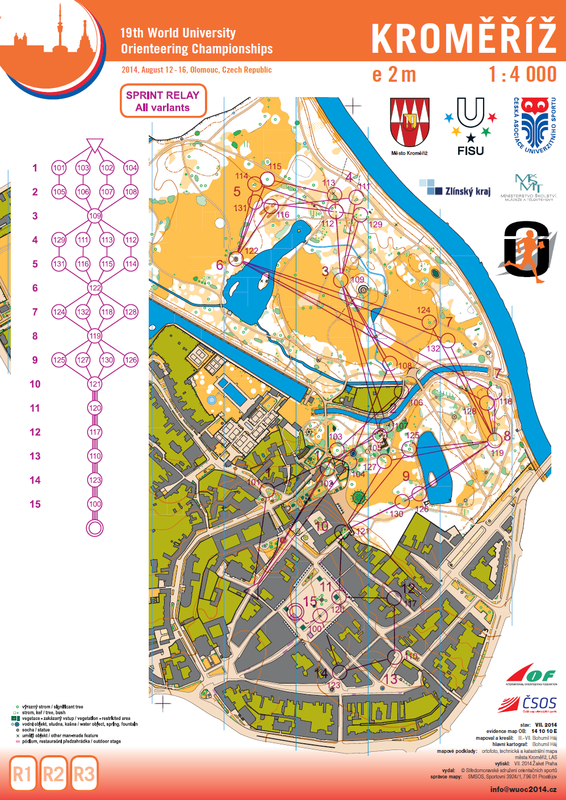 The relay was in Trento, a small Italian town. As someone who is still getting used to a large amount of spectators at orienteering events it was a pretty cool experience. All off the athletes were in quarantine before the race started and then the organizers would let us know when it was time for our leg to move to the arena. BUT before that happened, we had to get suited up! I have never run with so many gadgets before. First you put on your timing anklet, then your GPS unit and then because we were using the new ‘touch free’ SI air system and they wanted to make sure it worked correctly, they had us carry one on our fingers and one on our wrists. So in total we had two SI’s, a GPS, timing ankle and then the usual watch and compass…. I also wanted to say a huge thank you to all the Italian volunteers that put in countless hours to make WOC 2014 happen. It was a great week and your efforts are truly appreciated!